We identified a murine peptide-specific CD8 T regulatory cell population able to suppress responding CD4 T cells. Immunization with OVA, poly(I:C), and anti-4-1BB generated a population of SIINFEKL-specific CD8 T regulatory cells that profoundly inhibited peptide-responding CD4 T cells from cellular division. The mechanism of suppression required IFN-γ, but IFN-γ alone was not sufficient to suppress the responding CD4 T cells. The data show that CD8 T regulatory cells were unable to suppress unless they engaged IFN-γ. Furthermore, even in the absence of recall with peptide, the CD8 T regulatory cells suppressed CD4 responses as long as IFN-γ was present. To examine the effector mechanism of suppression, we showed that neutralizing TGF-β inhibited suppression because inclusion of anti-TGF-β rescued the proliferative capacity of the responding cells. TGF-β-based suppression was dependent completely upon the CD8 T regulatory cells being capable of binding IFN-γ. This was the case, although peptide recall of primed IFN-γ −/− or IFN-γR−/− CD8 T cells up-regulated pro-TGF-β protein as measured by surface latency-associated peptide expression but yet were unable to suppress. Finally, we asked whether the CD8 T regulatory cells were exposed to active TGF-β in vivo and showed that only wild-type CD8 T regulatory cells expressed the TGF-β-dependent biomarker CD103, suggesting that latency-associated peptide expression is not always congruent with elaboration of active TGF-β. These data define a novel mechanism whereby IFN-γ directly stimulates CD8 T regulatory cells to elaborate TGF-β-based suppression. Ultimately, this mechanism may permit regulation of pathogenic Th1 responses by CD8 T regulatory cells. Suppression of autoimmunity while maintaining the ability to mediate antitumor and pathogen immunity is a major goal for the health of humans. Enforcing T cell costimulation induces productive immunity against tumors and pathogens, whereas blocking costimulation inhibits autoimmunity (1, 2). In particular, CD28, CD40, CD134, and other costimulators are model examples of this point. An exception is CD137 or also knows as 4-1BB (3). Immunity against tumors and viruses are mediated robustly through 4-1BB activation (4, 5, 6), but importantly, autoimmune disease such as that observed during the induction of experimental autoimmune encephalomyelitis (EAE)3, lupus, and collagen-induced arthritis are inhibited profoundly (7, 8, 9, 10, 11). Thus, how can CD137 amplify immune responses and at the same time nullify autoimmune disease? This enigma cannot be explained by CD137-inducing defective effector properties because CD137 activates CD8 (12) and CD4 (13, 14), T cells in function assays, including cytokine synthesis (8), CTL-induced killing (12), proliferation (15), and survival (16). Nevertheless, previous reports demonstrated that during 4-1BB costimulation CD4 T cells were poor helpers of B cells and susceptible to deletion (7, 17). Mechanistically speaking, one study showed that the 4-1BB-primed CD8 T cells possess suppressor function against CD4 T cells in a TGF-β-dependent manner (18), and a second study confirmed this role for 4-1BB-primed CD8 T cells but demonstrated that suppression was IFN-γ dependent (11). To clarify this puzzling issue, we generated 4-1BB-primed CD8 effector T cells and tested their ability to regulate T cell function in a peptide-based suppressor assay. Primary or secondary responses of specific CD4 T cells were suppressed when 4-1BB-primed CD8 effector T cells were stimulated with specific peptide. Consistent with a recent study, CD4 T cell suppression was reversed in the absence of IFN-γ (11). Mechanistically speaking, IFN-γ-dependent suppression was induced only through peptide-specific CD8 T cells that bore the IFN-γR. After IFN-γR ligation, the CD8 suppressor T cells elaborated TGF-β-dependent suppression of CD4 T cell proliferation. These data define a novel mechanism causally linking IFN-γ as the direct activator of peptide-specific CD8 suppressor T cells culminating in the induction of suppressive molecules like active TGF-β. Collectively, we have integrated our results and those from recent and historical studies into a unified CD8 suppressor T cell model. C57BL/6, IFN-γ−/−, IFN-γR−/−, inos−/−, perforin−/−, and gld mice were purchased from the National Cancer Institute or from The Jackson Laboratory. The SM1 TCR-transgenic mice were RAG2−/−, and all mice were maintained at the University of Connecticut Health Center animal facility in accordance with federal guidelines. All mouse injections were through the i.p. route in sterile balanced salt solution (BSS). The agonist anti-4-1BB mAb was purified from 3H3 hybridoma culture supernatant using protein G agarose (Invitrogen Life Technologies) (12). Anti-4-1BB was injected at a dose range between 25 and 100 μg, which was based on batch-to-batch potency as determined by an in vivo titration assay measuring specific T cell clonal expansion (data not shown). The control for anti-4-1BB was purified rat IgG (Sigma-Aldrich) and was administered at an equal dose. Polyinosinic · polycytidylic (PIC) was injected at 150 μg and OVA at 1 mg (Sigma-Aldrich). 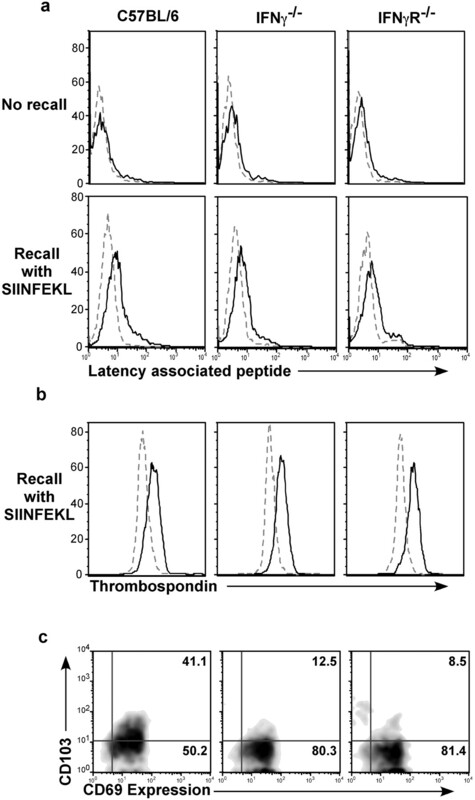 For in vivo recall experiments, 100 μg of SIINFEKL peptide (Invitrogen Life Technologies) were injected 7 days after a primary immunization with OVA/anti-4-1BB/PIC. In Fig. 7⇓, spleen cells were harvested for analysis 1 day following SIINFEKL recall. Spleens were crushed through nylon mesh cell strainers (Falcon; BD Biosciences), and RBCs were lysed with ammonium chloride. The cells were washed several times with BSS, counted using a Z1 particle counter (Beckman Coulter), and placed into staining buffer (BSS, 3% FBS, and 0.1% sodium azide). For staining, nonspecific Ab binding was blocked with a mixture of 5% normal mouse serum, culture supernatant from the 2.4.G.2 hybridoma (19), and 10 μg/ml human γ-globulin (Sigma-Aldrich). The primary incubation with mAbs was for 30 min on ice. Anti-CD4, -CD8, -CD11a, -CD103, -CD69, and -Thy1.1 mAbs were purchased from either BD Pharmingen or eBioscience, and the mAbs were either conjugated to FITC, PE, allophycocyanin, PerCP, or PE-Cy5. For surface TGF-β staining, a mouse IgG1 anti-latency-associated peptide (LAP) (R&D Systems) was conjugated to FITC using a Fluorotag FITC conjugation kit (Sigma-Aldrich). Anti-thrombospondin (TSP) mouse IgG1 mAb A6.1 (Neomarkers) was conjugated directly to PE by Molecular Probes. To control for nonspecific background staining, we used mouse IgG1-FITC and mouse IgG1-PE (eBioscience). For tetramer staining, SIINFEKL-tetramer was incubated with cells for 1.5 h at room temperature (a kind gift from Dr. L. Lefrançois, Division of Immunology, University of Connecticut Health Center, or purchased from Beckman Coulter), followed by 30 min on ice with various mAbs. For intracellular cytokine staining, splenocytes from mice immunized 7 days earlier with OVA/3H3/PIC were cultured in complete tumor media (CTM) medium (MEM containing amino acids, salts, antibiotics, and 7% FBS) at 106 cells/well in U-bottom 96-well plates (Falcon) for 5 h at 37°C and 5% CO2 with 1 μg of brefeldin A (Calbiochem). The cultures were stimulated with or without 5 μg/ml SIINFEKL peptide (Invitrogen Life Technologies). Cells were stained with anti-CD8-allophycocyanin, fixed with 2% paraformaldehyde diluted in BSS, and then permeabilized with 0.25% saponin (Sigma-Aldrich) in staining buffer. The cells were incubated at room temperature with an anti-IFN-γ-PE (eBioscience) or an isotype control Ig (eBioscience) for 15 min followed by an additional 30 min on ice. A similar approach was used for TSP staining. Cells were analyzed on a FACSCalibur (BD Immunocytometry Systems), and the analysis was completed using CELLQUEST (BD Biosciences) and FlowJo (TreeStar) software. Mice were immunized with OVA/anti-4-1BB/PIC, and 7 days later, 1 × 106 RBC-depleted splenocytes were incubated in triplicate in 96-well U-bottom plates and stimulated with combinations of medium alone, 5 μg/ml SIINFEKL, 5 μg/ml OVA265-280, and 50 μg/ml OVA323-339 for 72 h at 37°C and 5% CO2. During the last 8 h of culture, 1 μCi of [3H]thymidine was added to each well, and the samples were counted using a cell harvester (TomTec; Wallac) and a 1450 Microbeta Trilux scintillation counter (Wallac). A measurement of responding CD4 T cell division is shown schematically in Fig. 2⇓a. RBC-depleted spleen cells from unimmunized SM1 mice were incubated at 37°C for 10 min with 1.5 μM CFSE in medium free of FBS. Ice-cold CTM was used to stop the reaction, and ∼10,000 responding CD4 T cells were cultured with 900,000 enriched CD8 T cells taken from the spleens of mice immunized 7 days previously with OVA/3H3/PIC. Of this CD8 population, only ∼10% are SIINFEKL tetramer positive (see Fig. 1⇓b). The only exception was in Fig. 3⇓b where CD8 T cells were omitted, but 1 μg/ml rIFN-γ was added (R&D Systems). Negative selection was used to enrich for CD8 T cells by primary incubation with anti-B220 and -CD4 mAbs followed by negatively selecting with Dynabeads (Dynal Biotech). CD8 T cell purity was typically in the range of 65 to 85% as measured by flow cytometry. Specific CD8+ effector T cells reduce [3H]thymidine incorporation by recalled CD4+ T cells in an IFN-γ-dependent fashion. a, Mice were immunized with OVA, anti-4-1BB, and PIC. Seven days later, 1 × 106 whole splenocytes were cultured for 72 h with either the CD4 peptide OVA323-339, the CD8 peptide SIINFEKL, or both. The second C57BL/6′ treatment group was treated with OVA265-280. During the last 8 h of culture, 1 μCi of [3H]thymidine added to each well and the average counts per minute with SD of triplicate wells are shown. Data are representative of 7 gene-deficient mice, 3 IL-2−/− mice, and over 20 C57BL/6 mice across multiple experiments. b, Spleen cells from the C57BL/6 and IFN-γ−/− mice from a were analyzed by flow cytometry for SIINFEKL-specific CD8+ T cells. Viable CD8+ T cells were gated, and the number shown in the upper right quadrant is the percentage of double positive CD11ahigh SIINFEKL-tetramer cells. c, Spleen cells taken from mice immunized with OVA, anti-4-1BB, and PIC 7 days previously were analyzed for IFN-γ production after a 5-h in vitro recall with SIINFEKL. The percentage of CD8 T cells producing IFN-γ is given in the upper right quadrant. Intracellular cytokine staining is representative of two mice in two separate experiments. The cultures were stimulated with medium alone, 5 μg/ml SIINFEKL, and/or 1000 nM flagellin peptide427-441 (Invitrogen Life Technologies). In some experiments, 1 μg/ml rIFN-γ (R&D Systems), 50 μg/ml neutralizing mAb (1D11.16) anti-TGF-β (20), or control Ig (kind gifts from S. Ledbetter, Genzyme, Framingham, MA) were added. Previous studies have shown that the agonist mAb specific for 4-1BB can mediate tumor clearance as well as mitigate autoimmunity (4, 7, 8, 9, 10, 11, 21). The mechanism for these apparently contradictory results is unknown but has been suggested to involve inhibition of CD4 effector T cell function (22). We set out to establish a peptide-based suppressor assay that would allow input of natural nontransgenic CD8 T cells with varying abilities to carry through effector function. In the past, we found that immunization of C57BL/6 mice with OVA, PIC, and anti-4-1BB induces a SIINFEKL-specific effector CD8 T cell population (18). To ask if this population possessed the ability to suppress CD4 T cells, OVA-primed spleen populations were stimulated in vitro with CD4-specific OVA peptides in the presence or absence of SIINFEKL (Fig. 1⇑a). As expected, the CD4 recall response was vigorous, but the recall response to SIINFEKL alone was weak, although there were many SIINFEKL-binding tetramer cells (Fig. 1⇑b, top panel). The combination of the CD4- and CD8-specific peptides resulted in inhibited [3H]thymidine incorporation. To evaluate how this could be overcome, we tested five different genetically altered populations and found that suppression of CD4 responses was observed in IL-2−/−, gld, inos−/−, and perforin−/− mice to varying degrees (data not shown). However, IFN-γ−/− mice showed the greatest level of [3H]thymidine incorporation when stimulated with both CD4 and CD8 peptides at the same time (Fig. 1⇑a, ▪). 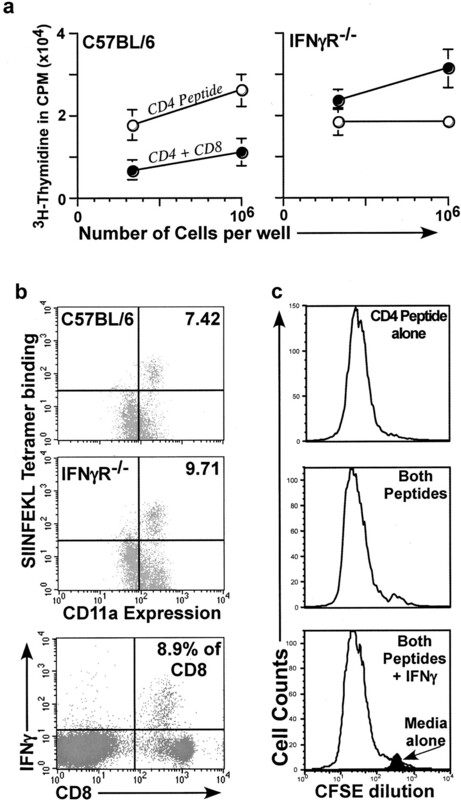 One possibility to explain this data would be a lack of CD8 T cells capable of binding SIINFEKL tetramer in IFN-γ−/− mice, but the data show there were more IFN-γ−/− cells capable of binding tetramer than compared with wild type (Fig. 1⇑b). To test whether the block in suppression correlated with IFN-γ production, IFN-γ synthesis was measured using intracellular cytokine staining. As expected OVA-primed CD8 T cells from IFN-γ−/− mice produced no IFN-γ but wild type and the other knockouts did (Fig. 1⇑c, and data not shown). Because this assay did not allow visualization of primary CD4 T cell responses or the degree of proliferation, we developed a new suppressor assay (Fig. 2⇓a). IFN-γ is essential for suppression of CD4+ T cell division. a, CFSE-labeled transgenic CD4+ SM1 naive T cells were cultured with enriched CD8+ T effector cells in presence of CD4-specific flagellin peptide, SIINFEKL peptide, or in combination. b, CD8+ T effector cells were taken from spleens of C57BL/6 or IFN-γ−/− mice immunized 7 days previously with OVA/anti-4-1BB/PIC. After 48 h in culture, CFSE dilution by the CD4+ T cells was analyzed by flow cytometry. Data are representative of nine similar experiments across multiple time points, and details of cell numbers are given in Materials and Methods. c, Exogenous rIFN-γ was added (▦) or not (□) to cultures containing IFN-γ−/− CD8 T cells with CFSE-labeled SM1 TCR-transgenic CD4 T cells and both the CD4 and CD8 peptides. CFSE dilution was analyzed at 48 and 72 h by flow cytometry. Data are representative of eight similar experiments across multiple time points. In this system, CD4 T cells were labeled with CFSE, and dilution of fluorescence was used as a measurement of proliferative capacity in the presence or absence of stimulated effector CD8 T cells. At 48 h, primed CD8 T cells from C57BL/6 cells vs primed CD8 T cells from IFN-γ−/− mice were compared in their ability to suppress CD4 T cells taken from SM1 TCR-transgenic mice (Fig. 2⇑a). Compared with medium alone, CD4 T cells did not respond to the CD8 peptide (SIINFEKL) nor were they killed by the CD8 T cells because they were still present. Flagellin peptide (CD4 peptide) induced the vast majority of CD4 T cells to undergo at least one round of division, and the presence of either population of CD8 effector T cells did not affect this response. In contrast, inclusion of the CD8 and CD4 peptides blocked CD4 T cell division when the CD8 T cells were derived from C57BL/6 mice but not from IFN-γ−/− mice. Also, enriched CD8 T cells from unimmunized mice did not effect the CD4 response regardless of which peptides were added (data not shown). 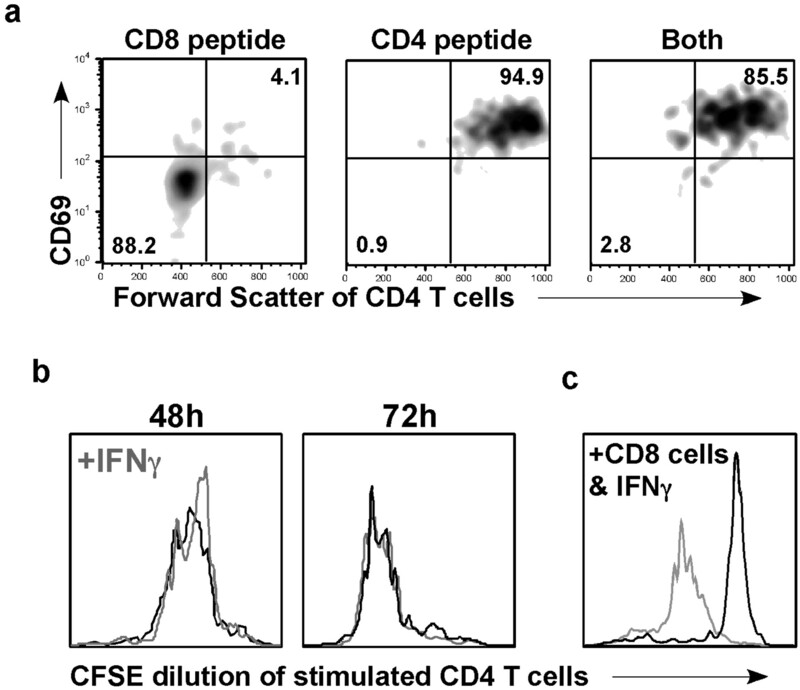 To determine whether the CD8 T cells from the IFN-γ−/− mice were ever capable of suppressing, IFN-γ was added to the cultures containing both peptides, and at 48 and 72 h, CFSE dilution of the CD4 T cells was examined (Fig. 2⇑c). Inclusion of IFN-γ rescued the suppressive ability of the IFN-γ−/− CD8 T cells. 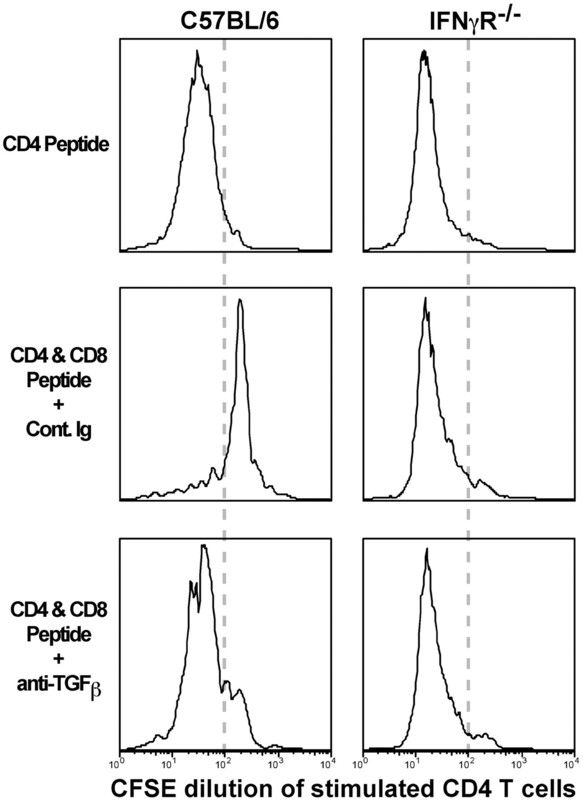 The mode of suppression was examined by determining the status of the responding CD4 T cells. Suppression was not dependent on cell killing because the presence of peptide-stimulated CD8 T cells did not cause disappearance of the CD4 responders but only prevented their proliferation (Fig. 2⇑b). This led to the notion that peptide-specific CD4 T cell activation may have been inhibited when the CD8 T cells were stimulated. Viable CD4 T cells were gated after activation under three stimulation conditions (CD8 peptide, CD4 peptide, or both peptides) and examined for their activation status (Fig. 3⇓a). The data confirm that the responding CD4 cells do not disappear after CD8 T cell stimulation. Furthermore, the CD4 cells up-regulate CD69 and blast to equivalent levels after CD4 peptide stimulation whether or not the CD8 peptide is included. Therefore, suppression occurs in the face of CD4 T cell activation as measured by blastogenesis (forward scatter) and up-regulation of CD69. Responding CD4 T cells become activated in response to the peptide but cannot divide when both CD8 suppressor cells and IFN-γ are present. a, SM1 CD4 T cells were cultured for 48 h with enriched CD8+ T cell effectors as described in Fig. 2⇑a and were analyzed by flow cytometry for CD69 expression and forward scatter in the presence of SIINFEKL peptide or flagellin peptide or both. The numbers indicate the percentage of double negative or double positive cells. Data are representative of seven experiments across multiple time points. b, CFSE-labeled whole splenocytes from SM1-transgenic mice were cultured with flagellin peptide with (light line) and without (dark line) exogenous rIFN-γ. CD4 T cells were analyzed by gating on Thy1.1, and the dilution of CFSE was monitored across multiple time points by flow cytometry. This data are representative of six experiments. c, CFSE-labeled SM1 cells were cultured with CD8 T cells enriched from the spleens of IFN-γ−/− mice immunized 7 days previously with OVA, anti-4-1BB, and PIC. Flagellin peptide alone (light line) or flagellin peptide with recombinant IFN-γ (dark line) was added to the cultures, and the dilution of CFSE by the responding CD4 T cells was analyzed by flow cytometry at 72 h. Data are representative of multiple time points from four experiments. Because activation is not inhibited but CD4 cell division is blocked, we tested if a component in the supernatant was inhibitory. In one experiment, we found that incubating responding CD4 T cells with supernatants from 24, 48, 66, or 96 h-stimulated CD8 T cell cultures were unable to inhibit CD4 T cell division in response to flagellin peptide (data not shown). An additional test showed that IFN-γ did not inhibit division by the responding CD4 T cells because they divided comparably to a control culture that did not contain IFN-γ (Fig. 3⇑b). Therefore, in this model, IFN-γ was not directly inhibiting CD4 T cell division. CD8 T cells required peptide stimulation and the ability to produce IFN-γ to suppress (Figs. 1⇑a and 2c). We examined if suppressor function would be apparent if the CD8 suppressor T cells bound IFN-γ but were not recalled with specific peptide (Fig. 3⇑c). The data show that IFN-γ was sufficient to rescue suppressor function by the IFN-γ−/− CD8 T cells even in the absence of specific CD8 peptide stimulation. Therefore, these data suggest that CD8 T regulatory cells bind IFN-γ and then elaborate their suppressor ability. To confirm this notion, cells from IFN-γR−/− mice were tested in two different suppression assays. C57BL/6 and IFN-γR−/− mice were treated as in Fig. 1⇑a, and the data show that C57BL/6 CD4 responses were inhibited substantially when CD8 peptides were added into CD4 stimulated cultures, but CD8 stimulation actually enhanced CD4 responses in cell populations taken from IFN-γR−/− mice (Fig. 4⇓a). 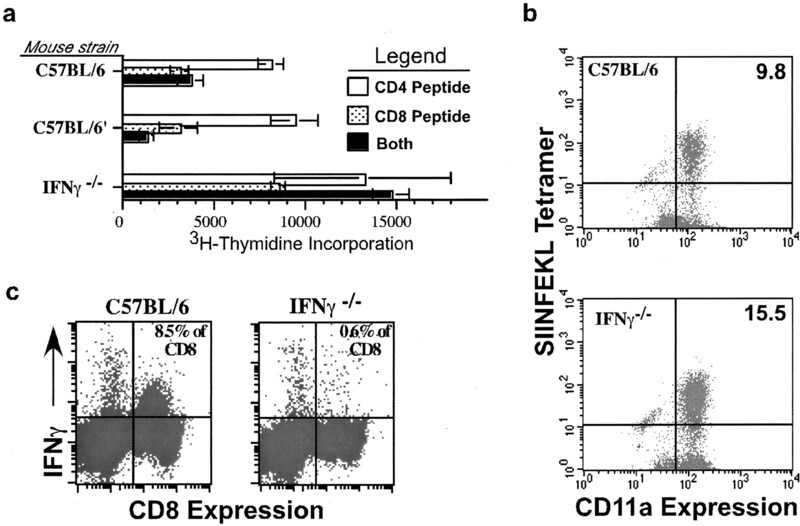 To determine whether the populations comprised similar levels of specific CD8 cells, SIINFEKL tetramer staining was performed and showed comparable staining in both the C57BL/6 and IFN-γR−/− populations (Fig. 4⇓b). Additionally, the same CD8 T cells from the IFN-γR−/− mice produced wild-type levels of IFN-γ in response to peptide stimulation (compare Fig. 1⇑c to the bottom panel of Fig. 4⇓b). A second suppressor assay showed that peptide-stimulated CD8 populations from IFN-γR−/− mice were unable to suppress CD4 responses (Fig. 4⇓c), and even the addition of IFN-γ did not rescue the suppressor activity. Thus, this is in contrast to CD8 populations from IFN-γ−/− mice where suppressor ability could be rescued by IFN-γ (compare bottom panels of Fig. 4⇓c to Fig. 2⇑c). These data show that CD8 suppressor T cells require direct binding of IFN-γ to suppress CD4 T cell division. Nevertheless, they do not show how CD8 suppression is imposed on the CD4 T cells. CD4+ T cell division is not suppressed when CD8+ T cell effectors fail to engage IFN-γ. a, C57BL/6 and IFN-γR−/− mice were immunized with whole OVA, anti-4-1BB, and PIC. Seven days later, whole splenocytes were cultured in U-bottom 96-well plates for 72 h with either the CD4 peptide OVA265-280 alone or with the CD8 peptide SIINFEKL. One microcurie of [3H]thymidine was added during the last 8 h of culture, and incorporation is presented as the average counts per minute with SD of triplicate wells. Data are representative of seven mice across three experiments. 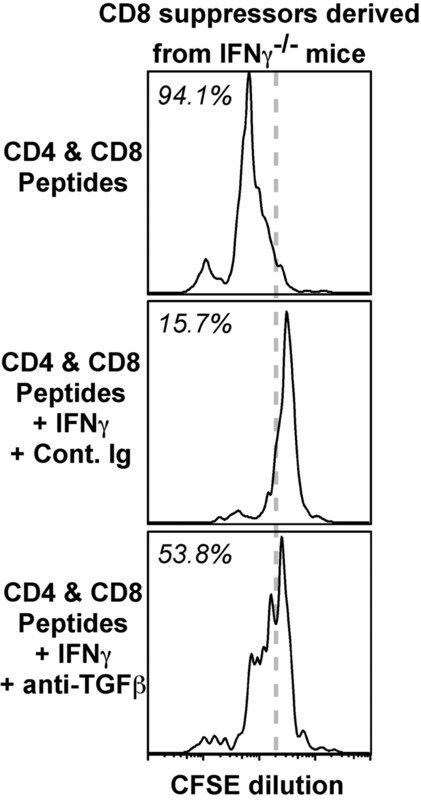 b, Live CD8 T cells from C57BL/6 or IFN-γ−/− mice shown in a were analyzed for the percentage of double positive CD11ahigh and SIINFEKL-tetramer cells (percentage given in the upper right quadrant). Spleen cells from another IFN-γR−/− mouse immunized 7 days previously with OVA, anti-4-1BB, and PIC were stimulated with SIINFEKL for 5 h in vitro then stained for intracellular IFN-γ (bottom panel). Data are representative of three mice. c, CFSE-labeled SM1 spleen cells were cultured with enriched CD8+ effectors (immunized 7 days previously with OVA, anti-4-1BB, and PIC-as in Fig. 2⇑) taken from IFN-γR−/− mice in the presence of the flagellin peptide, flagellin and SIINFEKL, or flagellin and SIINFEKL plus IFN-γ. After 63 h, dilution of CFSE on the responding CD4 T cells was evaluated. Data are representative of four experiments across multiple time points in vitro. Earlier data did not support a role for IFN-γ or other soluble factors in supernatants’ stimulated cultures as the effector mediating suppression (Fig. 3⇑b and data not shown), and direct killing was also ruled out (Fig. 3⇑a). Therefore, based on previous studies TGF-β was proposed as a possibility (18). TGF-β can be detected in cell membranes, in soluble form, but is a hydrophobic molecule that requires release from LAP into an active molecule (23). To test for a role of TGF-β in peptide-specific CD8 cell suppression in responding CD4 T cell populations, CD4 and CD8 T cells were stimulated in the presence or absence of a neutralizing mAb specific to murine TGF-β (20). The CD4 peptide stimulated nearly all CD4 T cells to divide as shown by the movement of the CD4 T cells to the left of the gray dotted analysis line (Fig. 5⇓). Inclusion of the CD8 peptide blocked CFSE dilution because the majority of CD4 cells were detected to the right of the analysis line. This was the case only if the CD8 suppressors possessed IFN-γRs (Fig. 5⇓, compare middle panels). Suppression in wild-type populations was blocked when TGF-β was neutralized (Fig. 5⇓, bottom left panel), but anti-TGF-β had no effect on control IFN-γR−/− CD8 T cells. Therefore, 4-1BB-primed CD8 suppressor T cells can suppress CD4 cells through TGF-β. TGF-β neutralization inhibits suppression mandated by the specific CD8 T cells. CFSE dilution by SM1 CD4+ T cells after 66 h in culture with flagellin peptide, flagellin, SIINFEKL and a control Ig, or both peptides plus a neutralizing TGF-β mAb in the presence of enriched C57BL/6 or IFN-γR−/− CD8+ effectors as described in Fig. 2⇑. Data are representative of nine experiments across multiple time points using C57BL/6 effectors and three experiments using IFN-γR−/− effector cells. The biology governing the mechanism of TGF-β activation in the immune system may involve its release from apoptotic cells and other mechanisms (24), but we propose that perhaps IFN-γ is a mediating link in elaborating TGF-β. As shown in Fig. 2⇑b, CD8 suppressors from IFN-γ−/− mice did not suppress unless they were offered IFN-γ. Similarly, the top and middle panels of Fig. 6⇓ show that 94.1% of the responding CD4 cells divided, but only 15.7% divided when IFN-γ was included in the culture, resulting in a 6-fold decrease in cell division. A 3.4-fold increase in CD4 cell division was observed when TGF-β was neutralized in the cultures containing peptide- and IFN-γ-stimulated CD8 suppressors from IFN-γ−/− mice (Fig. 6⇓, compare middle to bottom panels). These data suggest that IFN-γ can regulate TGF-β activation in CD8 suppressor cells. IFN-γ-based suppression elaborates active TGF-β. SM1 spleen cells were labeled with CFSE and cultured with CD8 effector T cells from IFN-γ−/− mice (immunized as in Fig. 2⇑) with flagellin and SIINFEKL; flagellin, SIINFEKL, IFN-γ, and control Ig; or flagellin, SIINFEKL, IFN-γ, and a neutralizing TGF-β mAb. After 48 h, CFSE dilution by the CD4+ T cells was monitored. Data are representative of five experiments across multiple time points in vitro. To test this idea, we examined whether TGF-β was detected exclusively on the surfaces of suppressor cells after recall stimulation. To accomplish this goal wild type, IFN-γ−/− and IFN-γR−/− mice were primed with OVA, anti-4-1BB, and PIC, and 7 days later, the mice were challenged in vivo with SIINFEKL peptide. Using flow cytometric analysis, we show that 1 day after challenge CD8+ SIINFEKL-tetramer bound cells expressed cell surface TGF-β as measured by LAP staining (Fig. 7⇓a). In no case were LAP-expressing cells detected in the absence of recall (Fig. 7⇓a, upper panel), but perhaps surprisingly, we found that specific cells taken from the wild-type, IFN-γ−/−, and IFN-γR−/− mice all expressed LAP when recalled. To pursue this further, we investigated whether TSP was involved in activating TGF-β. A number of biochemical studies have demonstrated that TSP is capable of activating TGF-β (23), and we examined this issue by performing intracellular staining on specific SIINFEKL-tetramer binding cells. TSP was expressed to equivalent levels after SIINFEKL recall in all cell populations tested (Fig. 7⇓b). Activated CD8 suppressor T cells uniquely possess CD103 following in vivo Ag recall. C57BL/6, IFN-γ−/−, and IFN-γR−/− mice were immunized with OVA, anti-4-1BB, and PIC, and 7 days later, mice received either 100 μg of SIINFEKL peptide or nothing. One day after recall, viable CD8+SIINFEKL-tetramer+ cells were gated and analyzed for (a) cell surface LAP (TGF-β) or (b) intracellular TSP expression (bold lines) and compared with a control Ig stain (gray dashed line). TSP is representative of six experiments across 4–14 mice, and LAP data are representative of three experiments across 3–5 mice. c, After recall, viable CD8 SIINFEKL-tetramer double positive cells were gated and analyzed for surface CD103 and CD69 expression. The percentage of CD103+CD69+ cells is given in the upper right quadrant. Data are representative of 12 similar experiments using between 7 and 22 mice. Therefore, under these conditions, our data show that TGF-β and TSP may not accurately distinguish CD8 suppressor T cells from nonsuppressors. It is documented that TGF-β expression in situ tightly associates with CD103 expression (25). This idea was tested with the expectation that CD103 coexpression would be detected on cells only able to activate LAP to release active TGF-β. Our data convincingly show that CD103 was detected predominantly on the CD69+-suppressing population from wild-type mice (Fig. 7⇑c). SIINFEKL-specific cells from the primed and challenged IFN-γ−/− and IFN-γR−/− mice were 12.5 and 8.5% double positive for CD69 and CD103, whereas wild-type cells were 41.4%. Background expression of both markers was detected when all groups of mice were primed but not challenged (data not shown). Thus, CD103 expression tracked only with the recalled specific CD8 T cells capable of suppressing. These data shed considerable light on the paradoxical function of the costimulatory molecule 4-1BB. On the one hand, agonist mAbs specific to 4-1BB can mediate clearance of pathogenic infections and established tumors (4, 5, 6) but on the other can suppress Ab production, EAE, lupus, and arthritis (7, 8, 9, 10, 11). The potency of 4-1BB-induced effector function is well documented, but immune suppression by the opposing cytokines IFN-γ and TGF-β was unknown. These data uncover a novel mechanism of CD8 suppressor T cell function. Specifically, IFN-γ binding to peptide-specific CD8 T cells directs the elaboration of TGF-β-based suppression onto specific CD4 T cells. Although peptide-specific CD4 T cells became activated, they were unable to clonally expand when exposed to CD8 suppressor T cells (or CD8 T regulatory cells) stimulated with a specific peptide. However, perhaps surprisingly, suppressor T cell function did not require specific recall through signal 1 because IFN-γ treatment was necessary and sufficient to direct suppressor activity. Ultimately, LAP and TSP expression were shown to associate with suppressor cells, but only CD103 was demonstrated to be a biomarker for recalled CD8 suppressor T cells. The suppressor assay depicted in Fig. 2⇑a allowed coculturing suppressors with CFSE-labeled responders while maintaining specific control of TCR activation using nominal peptides. We show that IFN-γ was essential for suppression but did not act directly on the responding CD4 T cells (Fig. 2⇑, b and c). This was surprising because IFN-γ primes immune responses toward the Th1 direction, resulting in inflammation and sustained pathology but not suppression of inflammation (26). Nonetheless, our data were consistent with the finding that IFN-γ−/− mice are highly susceptible to EAE induction (27, 28, 29). Furthermore, a more recent study showed that the lack of IFN-γ did not result in increased production of IL-4 or IL-10 as would be expected if there were a switch to Th2 responses (30). Similar to this finding were data showing that CD8 T cells can suppress EAE (31, 32, 33). Moreover, two different studies using comparable EAE models demonstrated that CD8+CD28− T cells suppressed disease and a second showed that an agonist mAb specific to 4-1BB suppressed disease progression as well (7, 34). This latter result is important because 4-1BB profoundly stimulates CD8 T cells and was recently shown to induce CD8+CD11c+ suppressors (11). Therefore, IFN-γ and CD8 T cells can paradoxically mediate and mitigate autoimmunity. Our data speak to these results by suggesting that during EAE IFN-γ may bind the IFN-γR on CD8 suppressor T cells and induce their activation. An important aspect of this mechanism is that effector T cells do not always require signal 1 to function. In Fig. 3⇑c, IFN-γ−/− suppressor CD8 T cells were stimulated with IFN-γ in the absence of signal 1, but they were still able to suppress CD4 responses. CD8 T cell binding of IFN-γ was essential because IFN-γR-deficient CD8 T cells were unable to mediate suppression even in the presence of IFN-γ (Fig. 4⇑). This is interesting at least from the perspective that paracrine effector cytokines can amplify bystanding suppressor responses without the benefit of the bystanders receiving signal 1. Therefore, pathogenic Th1 cells may secrete IFN-γ, which can be used by CD8 suppressor T cells to suppress the ongoing Th1 response. This is consistent with earlier data demonstrating that CD8 T cells can inhibit mortality during EAE perhaps by controlling resistance to a second induction of disease (33). Also, it is possible that the CD8 T regulatory cells and the putative autoreactive CD4 T cells may be specific to nonlinked peptides, but nevertheless, the CD8 T regulatory cells may use the IFN-γ produced from the CD4 T cell pool. Thus, this form of regulation uses specific CD8 suppressor cells to control CD4 effector responses based on the presence of at least IFN-γ. The release of active TGF-β from T cells is an understudied area of investigation with no established paradigm. Although TSP actives TGF-β (35), attempts to establish this as the mechanism in our model fell short. The data show that nonsuppressing CD8 T cells possessed abundant levels of TSP (Fig. 7⇑b), and this was true even without recalling the cells (data not shown). Other experiments using TSP-neutralizing peptides and Abs yielded equivocal results (unpublished data). Nevertheless, TSP may be involved, but the mechanism may rely on other factors that either control TSP activity or permit spatial alignment of LAP similar to the proposed role for αvβ6 integrin (36). This is consistent with recent data showing that surface CD36 on rat alveolar macrophages binds a complex of TSP/TGF-β, which in turn causes release of active TGF-β by a yet undescribed biochemical process (37). Acid release of active TGF-β is also an unlikely mechanism because the buffered tissue culture medium was the same in all cultures, and in at least one experiment, supernatant derived from stimulated CD8 cultures could not suppress CD4 T cell division (data not shown). Therefore, we favor a membrane-bound based mechanism, which is consistent with our preliminary immunoblotting data showing relatively no active TGF-β detected in supernatants (unpublished data). In any event, CD4 T regulatory cells also mediate release of active TGF-β (38), but the mechanism is unknown. A predominant subpopulation of T regulatory cells expresses CD4 and CD25. They have been implicated in suppressing antitumor responses, immunity to infection, and a variety of autoimmune diseases (39). Although TGF-β induction by CD4+CD25+ T regulatory cells is not thought to be obligatory for T regulatory cell function (40), it is clear that LAP is up-regulated on these cells after in vitro stimulation with anti-CD3 and IL-2 (38). Similar to our studies, CD4+CD25+ T cells inhibit T cell division, but a role for IFN-γ in activating these cells has not been addressed formally. In fact, there is very little information demonstrating how T regulatory cells become activated in vivo. Nevertheless, an important parallel between CD4 and CD8 suppressor cells is the fact that elimination of either population renders mice more susceptible to autoimmunity, which is reminiscent of classical studies showing collaboration between CD4 and CD8 suppressor cells (41, 42). Another similarity between CD4 and CD8 suppressor cells is the evidence of TGF-β-independent mechanisms of suppression. Although our data suggest that much of the suppression is TGF-β dependent (Figs. 5⇑ and 6⇑), it is nevertheless not totally dependent on TGF-β. Therefore, other suppression pathways, including IL-10 (43), Fas/Fas-L, (44), and IDO (45), may be involved in our model as well. Thus, there are many ways to facilitate immunosuppression, but this should not be surprising because induction of autoimmunity and productive responses to pathogenic infections occur through multiple schemes as well. Ironically, productive immunity and regulation both rely on costimulation (46). In the absence of costimulation, T cell clonal expansion and IL-2 production are decreased (47). Likewise, CD28 deficiency reduces the number of T regulatory cells, thereby enhancing autoimmunity (48). These results demonstrate how T cell costimulation can play dual roles in the immune response. The challenge is to decipher when suppression is triggered at the expense of diminishing immune activation. The 4-1BB costimulatory molecule is an example of this process because it induces massive CD8 T cell clonal expansion and survival (3, 49) and, as shown here, generates potent CD8 T regulatory cells. It is also clear that 4-1BB induces proliferation of CD4 T regulatory cells without IL-2 induction, but interestingly, 4-1BB induced these cells to produce IFN-γ (50). This is further complicated because others have shown that T regulatory cells can be inhibited by 4-1BB costimulation (51). Perhaps the explanation for these conflicting data boils down to timing of 4-1BB ligation and the differentiation state of the activated T cells. Taken together, 4-1BB functions like a rheostat by regulating immune activation through the control of effector and suppressing T cells. An issue arising from these studies is whether CD8 T regulatory cell development is completely dependent upon 4-1BB costimulation. The difficulty of addressing this issue is data showing that adjuvants enhance 4-1BB costimulation (52). Furthermore, CD8 T cell responses are enhanced synergistically when adjuvants are combined with enforced 4-1BB costimulation (18). Therefore, 4-1BB-deficient mice should prove to be important when addressing this issue because CD8 T cell priming will occur in the absence of 4-1BB costimulation. Nevertheless, it seems unlikely that an important process as immunoregulation by CD8 T regulatory cells would be governed by a single costimulator. This question remains open, but future experiments may uncover the different possibilities of how CD8 T cells can be conditioned to become T regulatory cells. Prevention of autoimmunity and induction of productive responses to pathogens and tumors rely upon the balance of tolerogenic and activating pathways. A pivotal step in this process will be to understand what event activates suppression in the face of effector responses. Our data suggest that the well-known cytokine IFN-γ is an important trigger for this process. Therefore, we conclude that 4-1BB can control effector and suppressive responses, which can potentially be exploited for therapeutic gain. We thank Robert Rossi for technical assistance. ↵1 This work was supported by National Institutes of Health Grants AI-52108 and AI-142858 (to A.T.V. ), and L.M. was supported by National Institutes of Health Training Grant T32-AI07080. ↵3 Abbreviations used in this paper: EAE, experimental autoimmune encephalomyelitis; BSS, balanced salt solution; PIC, polyinosinic · polycytidylic; LAP, latency-associated peptide; TSP, thrombospondin; CTM, complete tumor medium. Egen, J. G., M. S. Kuhns, J. P. Allison. 2002. CTLA-4: new insights into its biological function and use in tumor immunotherapy. Nat. Immunol. 3: 611-618. Salomon, B., J. A. Bluestone. 2001. Complexities of cd28/b7: CTLA-4 costimulatory pathways in autoimmunity and transplantation. Annu. Rev. Immunol. 19: 225-252. Vinay, D. S., B. S. Kwon. 1998. Role of 4-1BB in immune responses. Semin. Immunol. 10: 481-489. Melero, I., W. W. Shuford, S. A. Newby, A. Aruffo, J. A. Ledbetter, K. E. Hellstrom, R. S. Mittler, L. Chen. 1997. Monoclonal antibodies against the 4-1BB T cell activation molecule eradicate established tumors. Nat. Med. 3: 682-685. Halstead, E. S., Y. M. Mueller, J. D. Altman, P. D. Katsikis. 2002. In vivo stimulation of CD137 broadens primary antiviral CD8+ T cell responses. Nat. Immunol. 3: 536-541. Bertram, E. M., W. Dawicki, B. Sedgmen, J. L. Bramson, D. H. Lynch, T. H. Watts. 2004. A switch in costimulation from CD28 to 4-1BB during primary versus secondary CD8 T cell response to influenza in vivo. J. Immunol. 172: 981-988. Sun, Y., X. Lin, H. M. Chen, Q. Wu, S. K. Subudhi, L. Chen, Y. X. Fu. 2002. Administration of agonistic anti-4-1BB monoclonal antibody leads to the amelioration of experimental autoimmune encephalomyelitis. J. Immunol. 168: 1457-1465. Sun, Y., H. M. Chen, S. K. Subudhi, J. Chen, R. Koka, L. Chen, Y. X. Fu. 2002. Costimulatory molecule-targeted antibody therapy of a spontaneous autoimmune disease. Nat. Med. 8: 1405-1413. Foell, J., S. Strahotin, S. P. O’Neil, M. M. McCausland, C. Suwyn, M. Haber, P. N. Chander, A. S. Bapat, X. J. Yan, N. Chiorazzi, M. K. Hoffmann, R. S. Mittler. 2003. CD137 costimulatory T cell receptor engagement reverses acute disease in lupus-prone NZB × NZW F1 mice. J. Clin. Invest. 111: 1505-1518. Foell, J. L., B. I. Diez-Mendiondo, O. H. Diez, U. Holzer, P. Ruck, A. S. Bapat, M. K. Hoffmann, R. S. Mittler, G. E. Dannecker. 2004. Engagement of the CD137 (4-1BB) costimulatory molecule inhibits and reverses the autoimmune process in collagen-induced arthritis and establishes lasting disease resistance. Immunology 113: 89-98. Seo, S. K., J. H. Choi, Y. H. Kim, W. J. Kang, H. Y. Park, J. H. Suh, B. K. Choi, D. S. Vinay, B. S. Kwon. 2004. 4-1BB-mediated immunotherapy of rheumatoid arthritis. [Published erratum in 2004 Nat. Med. 10: 1261.]. Nat. Med. 10: 1088-1094. Shuford, W. W., K. Klussman, D. D. Tritchler, D. T. Loo, J. Chalupny, A. W. Siadak, T. J. Brown, J. Emswiler, H. Raecho, C. P. Larsen, et al 1997. 4-1BB costimulatory signals preferentially induce CD8+ T cell proliferation and lead to the amplification in vivo of cytotoxic T cell responses. J. Exp. Med. 186: 47-55. Gramaglia, I., D. Cooper, K. T. Miner, B. S. Kwon, M. Croft. 2000. Co-stimulation of antigen-specific CD4 T cells by 4-1BB ligand. Eur. J. Immunol. 30: 392-402. Cannons, J. L., P. Lau, B. Ghumman, M. A. DeBenedette, H. Yagita, K. Okumura, T. H. Watts. 2001. 4-1BB ligand induces cell division, sustains survival, and enhances effector function of CD4 and CD8 T cells with similar efficacy. J. Immunol. 167: 1313-1324. Pollok, K. E., Y. J. Kim, Z. Zhou, J. Hurtado, K. K. Kim, R. T. Pickard, B. S. Kwon. 1993. Inducible T cell antigen 4-1BB: analysis of expression and function. J. Immunol. 150: 771-781. Takahashi, C., R. S. Mittler, A. T. Vella. 1999. Cutting edge: 4-1BB is a bona fide CD8 T cell survival signal. J. Immunol. 162: 5037-5040. Mittler, R. S., T. S. Bailey, K. Klussman, M. D. Trailsmith, M. K. Hoffmann. 1999. Anti-4-1BB monoclonal antibodies abrogate T cell-dependent humoral immune responses in vivo through the induction of helper T cell anergy. J. Exp. Med. 190: 1535-1540. Unkeless, J. C.. 1979. Characterization of a monoclonal antibody directed against mouse macrophage and lymphocyte Fc receptors. J. Exp. Med. 150: 580-596. Dasch, J. R., D. R. Pace, W. Waegell, D. Inenaga, L. Ellingsworth. 1989. Monoclonal antibodies recognizing transforming growth factor β: bioactivity neutralization and transforming growth factor β2 affinity purification. J. Immunol. 142: 1536-1541. Wilcox, R. A., D. B. Flies, G. Zhu, A. J. Johnson, K. Tamada, A. I. Chapoval, S. E. Strome, L. R. Pease, L. Chen. 2002. Provision of antigen and CD137 signaling breaks immunological ignorance, promoting regression of poorly immunogenic tumors. J. Clin. Invest. 109: 651-659. Al-Shamkhani, A.. 2004. CD137: costimulator turns suppressor?. Immunology 113: 23-25. Murphy-Ullrich, J. E., M. Poczatek. 2000. Activation of latent TGF-β by thrombospondin-1: mechanisms and physiology. Cytokine Growth Factor Rev. 11: 59-69. Wahl, S. M., J. Swisher, N. McCartney-Francis, W. Chen. 2004. TGF-β: the perpetrator of immune suppression by regulatory T cells and suicidal T cells. J. Leukocyte Biol. 76: 15-24. Robertson, H., W. K. Wong, D. Talbot, A. D. Burt, J. A. Kirby. 2001. Tubulitis after renal transplantation: demonstration of an association between CD103+ T cells, transforming growth factor β1 expression and rejection grade. Transplantation 71: 306-313. Mosmann, T. R., R. L. Coffman. 1989. Th1 and Th2 cells: different patterns of lymphokine secretion lead to different function properties. Ann. Rev. Immunol. 7: 145-173. Willenborg, D. O., S. Fordham, C. C. Bernard, W. B. Cowden, I. A. Ramshaw. 1996. IFN-γ plays a critical down-regulatory role in the induction and effector phase of myelin oligodendrocyte glycoprotein-induced autoimmune encephalomyelitis. J. Immunol. 157: 3223-3227. Krakowski, M., T. Owens. 1996. Interferon γ confers resistance to experimental allergic encephalomyelitis. Eur. J. Immunol. 26: 1641-1646. Ferber, I. A., S. Brocke, C. Taylor-Edwards, W. Ridgway, C. Dinisco, L. Steinman, D. Dalton, C. G. Fathman. 1996. Mice with a disrupted IFN-γ gene are susceptible to the induction of experimental autoimmune encephalomyelitis (EAE). J. Immunol. 156: 5-7. Tran, E. H., E. N. Prince, T. Owens. 2000. IFN-γ shapes immune invasion of the central nervous system via regulation of chemokines. J. Immunol. 164: 2759-2768. Gaur, A., G. Ruberti, R. Haspel, J. P. Mayer, C. G. Fathman. 1993. Requirement for CD8+ cells in T cell receptor peptide-induced clonal unresponsiveness. [Published erratum in 1993 Science 260: preceding 281.]. Science 259: 91-94. Koh, D. R., W. P. Fung-Leung, A. Ho, D. Gray, H. Acha-Orbea, T. W. Mak. 1992. Less mortality but more relapses in experimental allergic encephalomyelitis in CD8−/− mice. Science 256: 1210-1213. Jiang, H., S. I. Zhang, B. Pernis. 1992. Role of CD8+ T cells in murine experimental allergic encephalomyelitis. Science 256: 1213-1215. Najafian, N., T. Chitnis, A. D. Salama, B. Zhu, C. Benou, X. Yuan, M. R. Clarkson, M. H. Sayegh, S. J. Khoury. 2003. Regulatory functions of CD8+CD28− T cells in an autoimmune disease model. J. Clin. Invest. 112: 1037-1048. Crawford, S. E., V. Stellmach, J. E. Murphy-Ullrich, S. M. Ribeiro, J. Lawler, R. O. Hynes, G. P. Boivin, N. Bouck. 1998. Thrombospondin-1 is a major activator of TGF-β1 in vivo. Cell 93: 1159-1170. Munger, J. S., X. Huang, H. Kawakatsu, M. J. Griffiths, S. L. Dalton, J. Wu, J. F. Pittet, N. Kaminski, C. Garat, M. A. Matthay, D. B. Rifkin, D. Sheppard. 1999. The integrin αvβ6 binds and activates latent TGF-β1: a mechanism for regulating pulmonary inflammation and fibrosis. Cell 96: 319-328. Yehualaeshet, T., R. O’Connor, J. Green-Johnson, S. Mai, R. Silverstein, J. E. Murphy-Ullrich, N. Khalil. 1999. Activation of rat alveolar macrophage-derived latent transforming growth factor β1 by plasmin requires interaction with thrombospondin-1 and its cell surface receptor, CD36. Am. J. Pathol. 155: 841-851. Nakamura, K., A. Kitani, I. Fuss, A. Pedersen, N. Harada, H. Nawata, W. Strober. 2004. TGF-β1 plays an important role in the mechanism of CD4+CD25+ regulatory T cell activity in both humans and mice. J. Immunol. 172: 834-842. Piccirillo, C. A., J. J. Letterio, A. M. Thornton, R. S. McHugh, M. Mamura, H. Mizuhara, E. M. Shevach. 2002. CD4+CD25+ regulatory T cells can mediate suppressor function in the absence of transforming growth factor β1 production and responsiveness. J. Exp. Med. 196: 237-246. Eardley, D. D., J. Hugenberger, L. McVay-Boudreau, F. W. Shen, R. K. Gershon, H. Cantor. 1978. Immunoregulatory circuits among T cell sets. I. T helper cells induce other T cell sets to exert feedback inhibition. J. Exp. Med. 147: 1106-1115. Cantor, H., J. Hugenberger, L. McVay-Boudreau, D. D. Eardley, J. Kemp, F. W. Shen, R. K. Gershon. 1978. Immunoregulatory circuits among T cell sets: identification of a subpopulation of T helper cells that induces feedback inhibition. J. Exp. Med. 148: 871-877. Kosiewicz, M. M., P. Alard, S. Liang, S. L. Clark. 2004. Mechanisms of tolerance induced by transforming growth factor β-treated antigen-presenting cells: CD8 regulatory T cells inhibit the effector phase of the immune response in primed mice through a mechanism involving Fas ligand. Int. Immunol. 16: 697-706. Mellor, A. L., D. H. Munn. 2001. Extinguishing maternal immune responses during pregnancy: implications for immunosuppression. Semin. Immunol. 13: 213-218. Powell, J. D., J. A. Ragheb, S. Kitagawa-Sakakida, R. H. Schwartz. 1998. Molecular regulation of interleukin-2 expression by CD28 co-stimulation and anergy. Immunol. Rev. 165: 287-300. Bour-Jordan, H., B. L. Salomon, H. L. Thompson, G. L. Szot, M. R. Bernhard, J. A. Bluestone. 2004. Costimulation controls diabetes by altering the balance of pathogenic and regulatory T cells. J. Clin. Invest. 114: 979-987. Watts, T. H., M. A. DeBenedette. 1999. T cell co-stimulatory molecules other than CD28. Curr. Opin. Immunol. 11: 286-293. Zheng, G., B. Wang, A. Chen. 2004. The 4-1BB costimulation augments the proliferation of CD4+CD25+ regulatory T cells. J. Immunol. 173: 2428-2434. Choi, B. K., J. S. Bae, E. M. Choi, W. J. Kang, S. Sakaguchi, D. S. Vinay, B. S. Kwon. 2004. 4-1BB-dependent inhibition of immunosuppression by activated CD4+CD25+ T cells. J. Leukocyte Biol. 75: 785-791. Takahashi, C., R. S. Mittler, A. T. Vella. 2001. Differential clonal expansion of CD4 and CD8 T cells in response to 4-1BB ligation: contribution of 4-1BB during inflammatory responses. Immunol. Lett. 76: 183-191.